It was certainly a high point for Amina, her mother, Becky, as well as her siblings who all thought of developing a Filipino brand way back in the late 90s. Though Becky has been manufacturing straw bags since the 80s, her products were sold all over the world under a foreign label. The family thought that, after years of serving the export sector, it was high time for them to launch their own label. Clockwise from top left: Pina Dulce with T’nalak base, raffia embroidery, beadwork, and brass crown; Helena bucket made from woven abaca with leather straps; Carmen Minaudiere with resin shell and clasp made from semi-precious stones set in brass. Entering the export market was next in the Aranaz family’s agenda, with CITEM’s Manila Wear program giving them the impetus to reach a wider audience. This was followed by the brand’s exposure through other high-profile trade shows abroad. 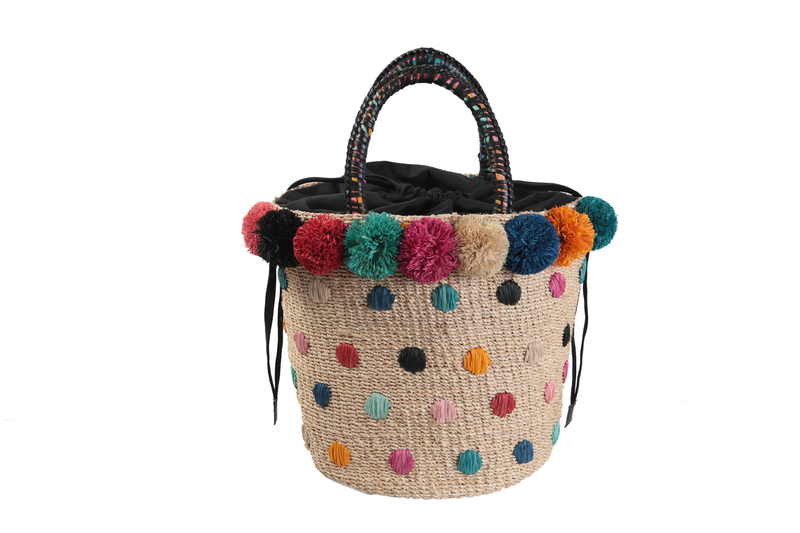 Fiesta Bonbon bucket with woven abaca and braided leather strap. According to Amina, “buyers loved the vibrancy” of their pieces, with “its rich mix of textures and treatments.” The style has defined the Aranaz brand, which is rooted to natural materials like raffia and abaca, as well as traditional weaves - such as the distinctive solihiya - and other handcrafts. An Aranaz bag or clutch may come in different forms or colors, but it will always stay true to its irrepressibly vibrant spirit. Martina Clutch with abaca-lined shell, raffia embroidery, beadwork and clasp made from semi-precious stones set in brass. Top photo: The Lily clutch bags feature Aranaz’s signature solihiya weaving. 344 Robinson Circle, Capt. Henry Javier St.